Since I have become a blogger at the start of Missy Moo’s life, every thing I record has been in the here and now. I kept thinking to myself, what about all those amazing memories of Buba’s first two years? So I decided I would do flashbacks to document those just as important memories with my first born and catch up! 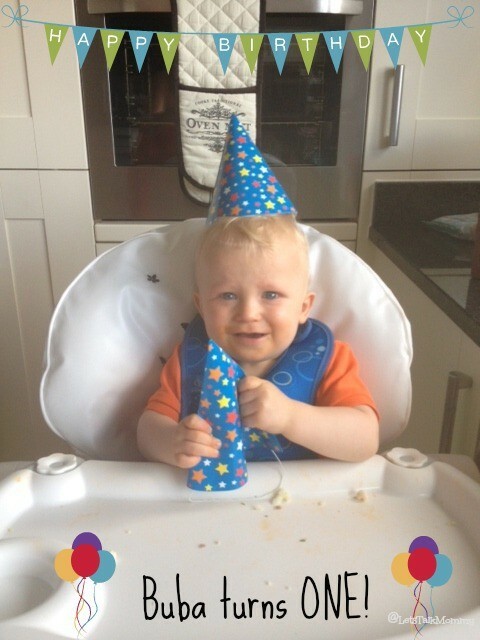 My first one, is a flashback to his 1st birthday, a big milestone for any child especially your first. The first year, goes way too fast. 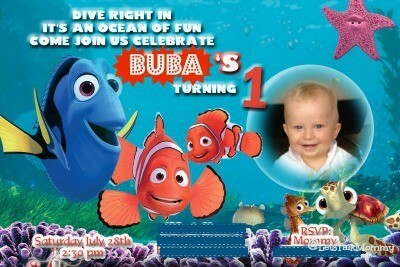 I couldn’t believe when it got close to August 6th, 2012 and it was time for me to plan Buba’s 1st birthday party. Could he really be that old already? I looked down at this still little baby in my arms and thought, no way! I waited till the last minute because I was in pure denial that my first born could possibly be turning one! Buba is lucky because the way his birthday falls he actually gets two birthdays depending on which country he is in at the time. I am American, so we tend to be in America for the months of July and August. August being his birthday, Buba is very lucky to have had a birthday party before we left and one on his actual birthday in the states. With an eight hour time difference his birthday is actually August 5th in America instead of August 6th as it says on his birth certificate. Both of my children’s birthday fall like this, so it’s always a funny story when people ask is today your birthday or tomorrow in the states. For his 1st birthday in England, we chose Nemo for the theme, at the time that was the only disney movie we owned so his choices were limited. lol I was lucky to have found a really supportive Mommy group and a best friend in my next door neighbor when Buba was first born, so they all came over to our house to join in the celebrations. One lovely guest even came as Bruce, the shark, and he looked so adorable. Thank you J.! We got lucky with the weather and the sun came out to play too. He loved all his closest friends running around his house, although I think he was perplexed about all the attention he was getting. He was even shy and particular, back then, bless him. The nemo theme was great, and each room in the house was something different from the movie. We had one room with Nemo coloring books and crafts, another room was the movies, playing Nemo, there were quotes from the movie all over the doors and walls to remind us all to “just keep swimming…just keep swimming!” I think I was more into Nemo then he was. The day was perfect, just what I wanted for my first born’s first birthday. On his actual 1st birthday, the day after he finally took his first step, Buba woke up not very well. To be honest, I think we all were full of a cold but he was the worse so we had to cancel his mini American birthday party and just have immediate family and his Godmother with us to celebrate. Mickey Mouse was the theme this time. My Mom made adorble Mickey cupcakes, egg free for Buba so he could have his very first piece of cake. 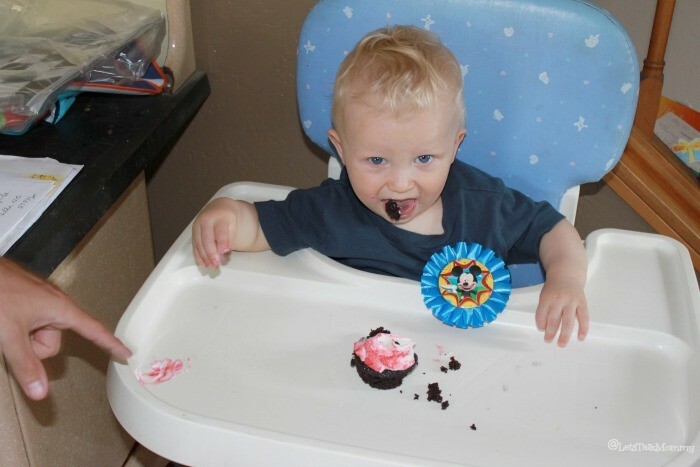 Due to his allergies he had never tried cake before. As you can see it took him awhile before he was shovelling it in by the handfuls. We opened a few presents before he was fed up, but we were all still reeling that he could walk from the night before. It became more about his new milestone then his actual birthday. lol Another successful special day, what a lucky boy, with two birthdays in two countries. I can remember how weird it felt to call him “a one year old”. My baby was growing up way too fast and I wasn’t ready for it. I wanted time to slow down so I could capture each moment. Standing there, holding him while he blew out his candles, I prayed the rest of his life wouldn’t go as fast as that first year went but I also looked forward to the next stage as you do with your first. Each one is the unknown because you have never been there before. Check out this video I made of both special days together! A little slideshow to remember those small special moments on his big special day(s). How lucky to have two birthday parties! 🙂 Your little Bubba is such a sweetheart 🙂 #WhatsTheStory. Thank you so much. That’s sweet of you to say. He is a handful at times but so tender and loving most of the time, especially when it comes to his baby sister. Thanks for stopping by and commenting. This is such a wonderful idea. I like the idea of doing flashbacks. And I really like devoting a different room in the house to different activities at a birthday party… I have made a note of that and will definitely use that in the future! Thanks Carin, I was trying to save money by having it at our house and making it like a little carnival, where the kids could choose what room and activity they wanted to do. We had a food and drink room too! 😉 It was perfect. 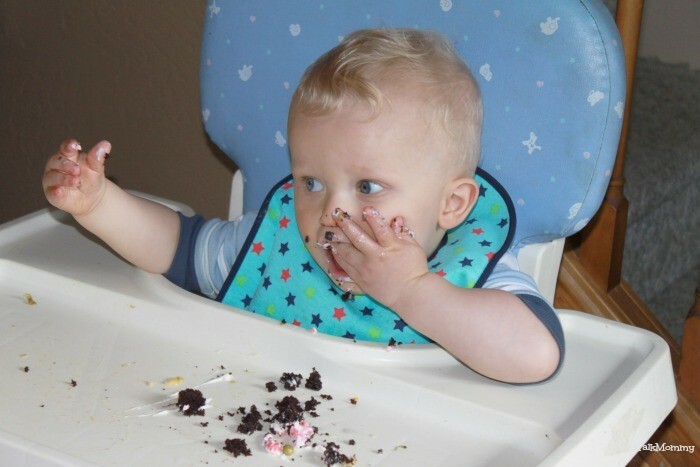 I love flashbacks it allows me to document Buba’s first two years when I wasn’t a blogger. I have so many great flashbacks I want to write before I forget them. 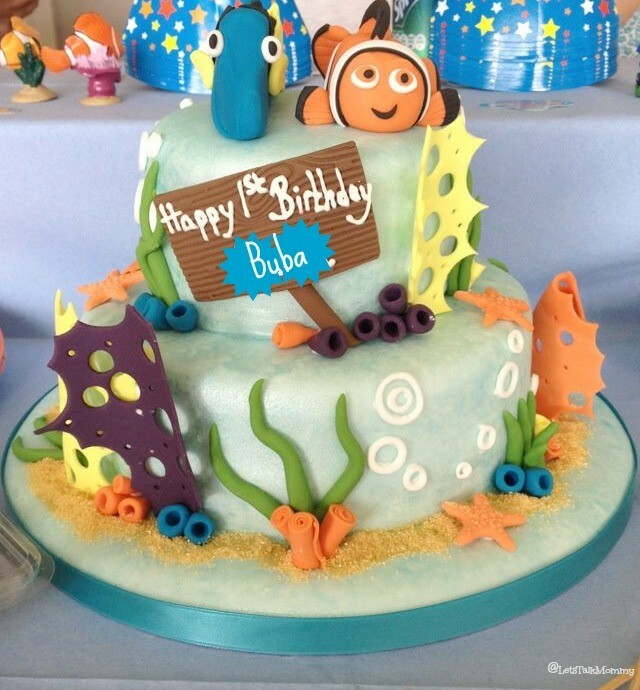 That Nemo cake is delightful! And a cool story for birthdays across time zones! I once flew back from paris to London on a night when the clocks went back and landed before we took off, weird! 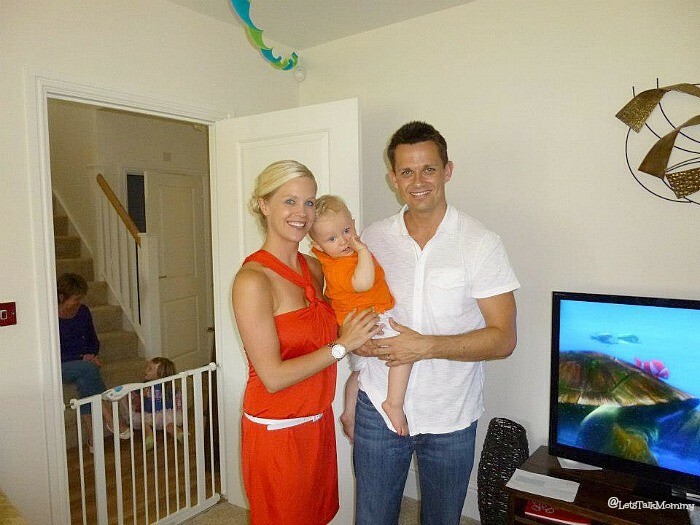 What a gorgeous family!! Awww what a cake too! !